Peter Lawford (7 september 1923 - 24 december 1984) was a British actor and producer. In 1943, he played a young sailor in Sherlock Holmes Faces Death with Basil Rathbone. 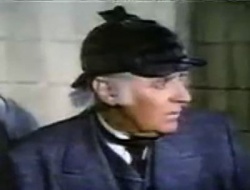 And in 1982, he played Sherlock Holmes himself in episode 15 of season 5 of Fantasy Island series: Save Sherlock Holmes.